The very first process for filing the claim is to get a bill in your name from the concerned doctor or medical assistant. The bill should have the list of all the services and the amount you have paid along with the unique code mentioned by the insurance company to get your claim. After getting the bill it is quite simple to give a call to the provider and inform about your claiming for health insurance. Henceforth, the provider will forward your bill along with little other information like the medical service date and your full name. It is documented form by which you give more information to the insurance company about the medical illness or accident that has happened. This form gives the idea to the company that the illness in question is covered under it or not, so the elaborate the form is it is better for the claimant. All the forms have instructions and directions to be completed and where they need to send. For any other query, the insurance company can be contacted. Date of Birth, Name, and address of the claimant. Information about insurance like group and policy number. The reason for doctor’s visit describing the condition and background or if it is concerning you or other family member covered under group insurance. Doctor's name and address are to be mentioned. If the pre-payment or Co-Pay is done, then it needs to be mentioned. Do's: One can attach more sheets to the claim form in order to explain each question. It is always beneficial to keep a copy of the claim form so that you also have the correct information that you have provided to the company. After submitting the form, keep the receipt as a proof that the form has been sent or been accepted by the insurance company as the case may be. Once all the information is assembled and the claim form is duly filled, then please check if all the requirements are completed and call the company to tell them about the form. Ask them whether they need any other document and the information provided by you is complete. This will help to make the process faster and hassle-free. After being satisfied, you should send the completed form with your registered email id to avoid any incidence of rejection. Generally, the entire health insurance claim needs to be filed within 7 days from the date of discharge from the hospital. The company can reject the claim if the forms and documents are not as per their policy. And mostly the whole of medical expenses may not be covered by the company. 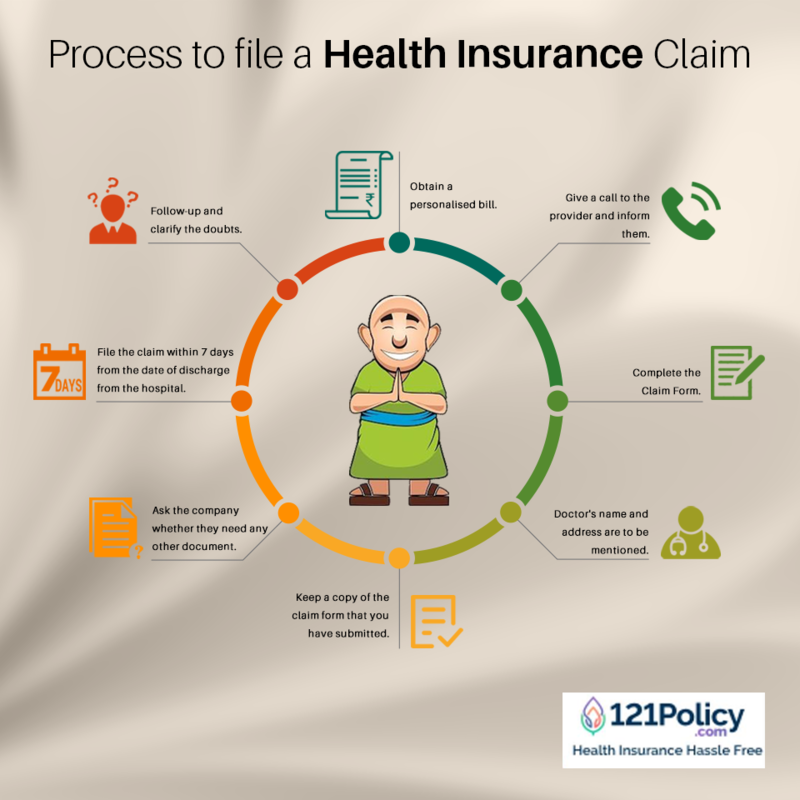 Do read and get a clear picture of your health insurance policy. Hence after dispatching one can only wait and keep checks on the calendar keeping in mind the time the company gave to settle the claim when you call them up. If you do not get the claim in the given time, call the company and take note of whom you spoke, the date and time and his position in the company and the assurance given by him which you can use if further follow-ups are required. Don't be shy in doing the follow-up by the company after the claim form is sent to them to know whether the documentation is complete or some additional things are required. Clarify your doubts if you are anxious to know that what amount you are going to get from the company. One can easily claim for the health insurance and avail the benefits if you keep the above points in mind. This rejection comes as a shock especially since you are burdened with your medical expenses which would have otherwise been covered by your health plan.